is there a way to move an existing archive created by the tool from one machine to another–and to then move the tool to a new machine, too? You can certainly move the tool between machines. See the User Guide section for an article on uninstalling or migrating the configuration files. The licensing is per machine so you can deactivate your current licence within the tool on the Licence Tab and then re-activate on the new machine as you would a fresh install. As for the archive this is stored in Microsoft’s Outlook database. It does not offer a programming interface or export function so we were not able to support this from our tool. You will have to manually move over the database to the new machine. There are many articles detailing the location of the files in Outlook 2011 and 2016 (where it’s different). Any problems please contact our support email. Sorry for late reply. Yes you can copy the profile database from machine to machine and the tool can be moved too. Thanks for sharing this tool information it is useful to us. What happens in a restore situation? 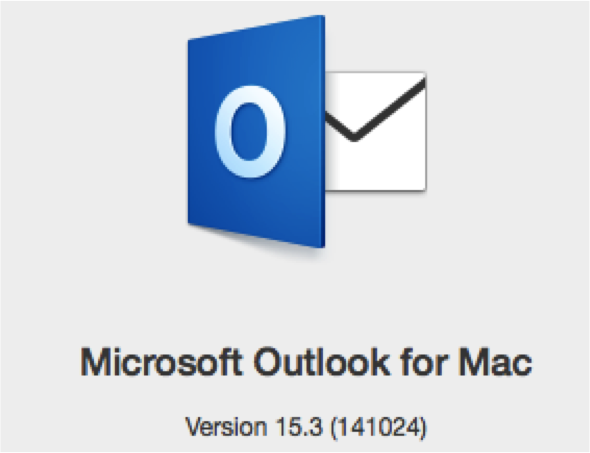 So my Mac blows up and I need to restore the Outlook archive data your tool has created. Provided I have a time machine backup of the Profile (which I believe is located in “~/Library/Group Containers/UBF8T346G9.Office/Outlook/Outlook 15 Profiles/Main Profile”), what happens next? I launch Outlook, reconnect to my Exchange account, and then restore using time machine the archived data to the original location? Is it possible to restore just the archive data your tool processed and not the entire profile? I would rather have Exchange pull everything down and just restore the archive data for local access. Michael, does each archive create a new archive file, or are they added to the existing file? Assuming there is a single archive file, if I have added or deleted folders since the previous archive, how is that handled? Thank you. Hi Bill, Outlook has a single database (comprised of many files). Your archive is simply stored in a root folder under ‘On My Computer’. This is a logical location within the Outlook database. You can add or delete folders there as much as you like. To backup your outlook database (which also includes your online mail account caches) you can use time capsule or manual methods. 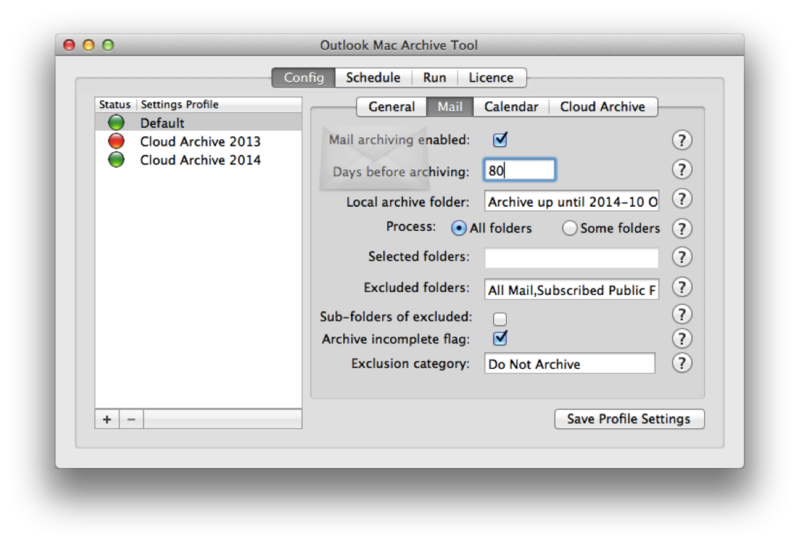 However our tool also offers a ‘push to cloud’ method which moves your mail in to a mail acount such as gmail. Michael, new to Outlook 2011 for Mac but am a heavy email user for business. I’ve recently manually archived by folders (Clients) to the “On My Computer” in Outlook 2011. Will your archiver work in moving these files to Dropbox? Hi Keith, our cloud archiving process isn’t at the file level. You could use time machine or other backup tools to backup your local Outlook database (referred to as an Identity by Microsoft). Our tool takes your mail in it’s folder structure and moves it into a cloud mail account (such as a gmail account). The advantage of this is your mail is accessible and searchable via Outlook or the web interface of mail. Whereas backups at a file level have to be restored before you can access them. See our user guides for more details on how our process works. What happens to email that has been flagged – e.g. added to tasks for follow-up? If they are archived into a different directory, does this break the flag? AutoArchive on the windows version would skip over flagged email – e.g. leave them in the original folder until the flag was removed. Hi Matt, great question, this is catered for in the tool. By default the tool will not archive items that are marked for follow-up but not complete (this includes flagged items that has no target date, as by definition these are always incomplete). If you wish to override that behaviour and archive them then there is setting in the advanced section of the mail configuration tab that allows you to do this. I have purchased the software and downloaded but when I come to use it says I can’t because:You have Mac OS X 10.6.8. The application requires Mac OS X 10.7 or later. Is there a solution to this without upgrading the operating system? Hi Sarah, unfortunately not, the program makes use of certain libraries in the operating system which were not present in 10.6.8. We reviewed getting more backward compatible but it would deteriorate the user experience beyond what we would like. Furthermore Apple’s latest operating system is now free. We do encourage customers to try the product before they buy (it’s free to try out in simulation mode). However, we don’t want you unhappy with your purchase so please contact us on support@7thdomain.com and we will arrange a refund if you aren’t ready to upgrade to a later operating system. I�m very happy to buy a license, as I have been so pleased with what you have done � but if I buy and download the software (which I only want to use to archive one Exchange account) will it upset what I have at the moment? I work on the philosophy �if it ain�t broke don�t fix�. Do I need to upgrade to get the same archiving? Can you confirm that eveni I (with little techie skills) could download your new better tool without mucking up your old tool that is working so well? Yes the new tool can even works side by side with the old tool, however it becomes redundant so ultimately it’s better to disable the old tool once the new tool is setup and working well. The key is to ensure that when you configure the new tool that you choose the same ‘Local Archive Folder’ under ‘On My Computer’ that you currently have your script storing your archived mail in to. The default in the script was: “Archive Mail”. Other than that the new tool is configured to all the same defaults as the script, so it can take over the archiving process and it will be seamless. We will support you throughout the process and you can contact support@7thdomain.com for any help. I’ll personally make sure the transition works for you.